Aliases: Knights Tempered, Knights of the Tempered Brotherhood, Robot Knights of the Tempered Brotherhood, Tempered Brotherhood, Temploid Order, "Robomonks"
Powers/Abilities: While the Temploids used to be savage warriors and still have the construction to be such, they are guided by the Program, which forbids them from participating in violent actions. Their abilities are directed towards helping and healing others. They have limited magical abilities, which enhance their power to heal beings and rebuild structures. They possess certain telepathic and empathic abilities. They can dampen violent or hurtful emotions in others. They are able to contain and slow disease processes, even such things as computer viruses. Their skills are such that they can even resurrect beings who have been otherwise dead for periods of time lasting no more than a few hours. History: The Temploids are a race of robotic beings, whose origins are unrevealed. (Battletide II#3 (fb)) - In the distant past, the beings who would become the Temploids were some of the most feared warriors in the cosmos. The Battletide threatened our homeworld. Confident of our martial prowess, we launched this warship to destroy the Tide. We were the supreme warriors in the Omniverse. What reason had we to flee a scavenging, demonic horde? The Battletide consumed our ship and then obliterated our homeworld. Our reliance on aggression doomed us. We were destroyed by our own pride and overconfidence. Only a handful of us survived the fires of armageddon. Those few survivors fled into space and founded the Temploid Order. In guilt, they turned away from war and embraced spiritual salvation through the sacred Program. Its blend of technology and high magic showed them the only way to atone for their failure was to become non-combatants and devote themselves to helping and healing any beset by the infernal Tide. Thus, the Brotherhood was born. (Battletide I#3 (fb)-BTS) - The Temploid Order either volunteered or was commissioned to participate in the Games of Termagent and Megaira on Colosseum. Their task was to resurrect the wounded and dying warriors. 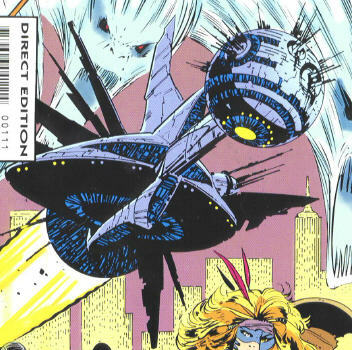 (Battletide I#2-4) - During the Games on Colosseum, the Temploids appeared before Dark Angel and Smith, warning them of the threat of the Battletide. Dark Angel and Smith warned the other heroes of Earth who were present, and they all met with the Temploids in between fight days. The Temploids explained their past actions in the Games, and revealed Termagent's decree that this cycle the fallen should not be restored. This butchery was summoning the Battletide, as intended by Termagent. They explained the full danger that the Battletide posed. 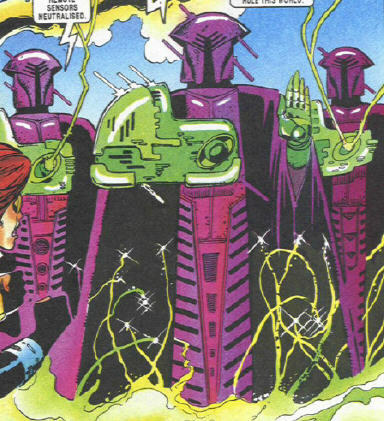 The heroes followed the Temploids lead, and the following day--with the aid of Killpower, who disabled their restraining collars--they broke free and attempted to destroy the omniversal transmitter, which would allow the Battletide to disseminate across the populated cosmos. Termagent, Megaira, and their guard arrived to stop them, but it appeared that the heroes were too late anyway, as the Battletide arrived on Colosseum. While Psylocke and Dark Angel shielded the heroes' minds from the Battletide, Termagent and Megaira re-combined into their elder form, that of the demon-lord Termagaira. The demon-lord then climbed the transmitter tower and summoned the Battletide into itself. Termagaira blasted and demolished the leader of the Temploids, but Death's Head and Killpower teamed up against the demon-lord, knocking it off the tower, and it was impaled on the tower's spokes. As Termagaira died it was reabsorbed by the Battletide which then went on a rampage. Killpower then followed the instructions of the leader of the Temploids, and fused its remaining circuitry with that of Death's Head. 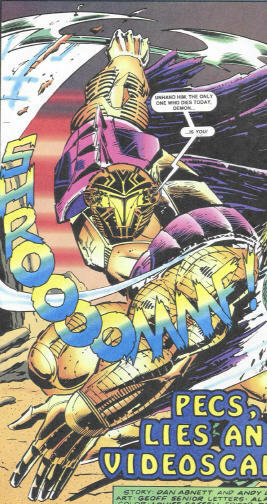 The Temploid combined its techno-mystical power with Death's Head's multiple (106) personalities/wills and drew the Battletide into their combined form, until it collapsed on itself. The Temploid and Death's Head's forms were destroyed, but Killpower put Death's Head back together--although he had quite a few pieces left over. The remaining Temploids then returned the heroes to their homes and set about treating the many beings injured during the arrival of the Battletide. 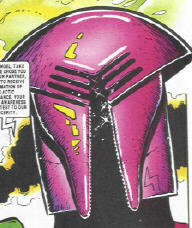 (Battletide II#3 (fb)) - The Temploids learned that the Battletide had somehow taken on a sinister intelligence. They sent one of their Order, Gabriel, on a scouting mission within the Battletide. It was his duty to transmit intelligence back to the Order's starship. Gabriel was severely damaged. He spent days eluding the demon-packs that were hunting for him. In desperation he fled into the catacombs and found a vessel--the very one consumed by the Tide eons before--where he took refuge. The ship provided Gabriel with the means to repair himself, but not without cost. By introducing ancient Temploid technology into his damaged systems, Gabriel inadvertently erased the Program which makes all Temploids pacifists. He became a throwback to the Temploids' barbaric past. Gabriel, now able to fight for his survival, learned that the necromancer Bezial had taken control of the Battletide. He transmitted this information back to the Temploid starship. (Battletide II#1-4) - The Temploids transported Death's Head, Killpower, and Tuck aboard their ship. They revealed Bezial's involvement and convinced the three to help overcome the threat. Death's Head was incapacitated by a computer virus left by Bezial, but the Temploids were able to keep the virus in check, so that Death's Head could function. Bezial then sent a demon to possess the Hulk, and sent the Hulk to attack those aboard the Temploid ship. Working together, they subdued the Hulk and kept him nullified in stasis. The Temploids then sent Death's Head and Killpower to the area outside the Dread Citadel, with the intent of having them defeat Bezial. Upon arrival, the Temploid accompanying them was obliterated by the demon-hordes, which caused the virus within Death's Head to flare back up and cripple him. Killpower was soon overwhelmed by demons and would have been slain, but Gabriel then arrived and aided them. Gabriel proved able to inhibit the virus as well, and with Death's Head back in action they were able to make their way into the Dread Citadel. They confronted Bezial, only to learn that he was possessing the powerful form of Termagaira. Termagaira/Bezial shattered Gabriel, which caused the virus within Death's Head to run rampant again, neutralizing him. Bezial then easily overpowered Killpower, hurling Gabriel's frame at him and knocking them both through the wall, where they fell hundreds of feet. Bezial toyed with the weakened Death's Head, battering him about, and revealing his plans to exponentially enhance the Battletide's power by allowing it to consume Earth, and then using it to make him self the master of the universe. However, Killpower managed to survive the fall--for a few minutes anyway--and he used his last moments to rebuild Gabriel, who again placed the virus in stasis. Revitalized, Death's Head attacked Bezial/Termagaira anew. He would likely have been overcome eventually, but he managed to catch Bezial unawares and utilize his cranial psyphon again. Bezial's mind was pulled back into Death's Head cyberspace mindscape, Termagaira's inert form dropped to the ground, and the controlling influence on the Battletide was abolished, sending it off of its Earthbound course. The Temploids managed to resurrect Killpower, and they then sent he, Death's Head, Tuck (and the Hulk) back to Earth. Gabriel possessing the same mystical healing skills as the other Temploids, but is able to access his battle programming and abilities as well. Gabriel's power level is uncertain, but he may possess Class 10-25 strength, combined with superhuman durability, and a vast store of battle training programmed within his mind.